Vending machines are ideal for streamlining indirect purchases. They offer 24/7 access to products and can reduce costs, raise productivity and improve safety. Lower product consumption – they help control usage of certain items and require employees to use a swipe card to access products. This allows employees to be accountable for items they’re using. Increased Control – Different levels of access can be placed on certain products so employees without authorisation can’t take out certain items. Increased productivity – Machines will be fitted near workstations and guarantee 24/7 availability – there is reduced downtime in production when an item runs out. An item should never be out of stock – minimum & maximum replenishment levels can be set and once the item reaches this, an automatic order is placed to re-stock. Improved Safety – employees have guaranteed access to the products required for their job – PPE equipment can quickly be replaced if required. 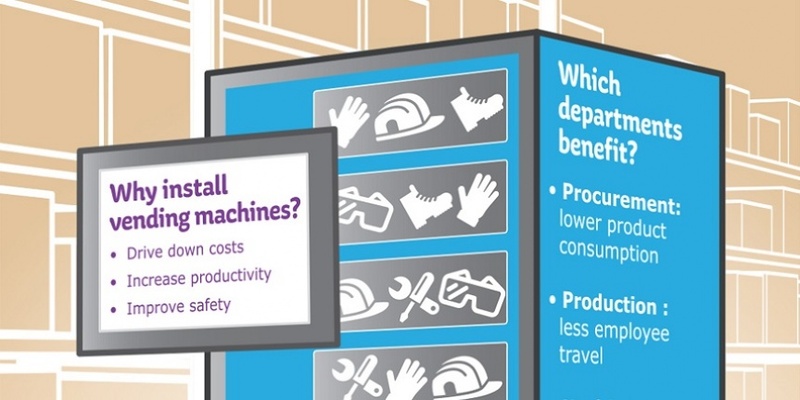 Vending machines talk directly to the supplier, ensuring the procurement process is more efficient. Reports can be created on usage – both templates and bespoke reports are available.